They way we buy things is changing. A lot of the focus lately has revolved around the smartphone with services like Apple Pay and Samsung Pay, but a new company Stratos still thinks the credit card has its place...you just shouldn't have to juggle a whole wallet full of them. That's where the Stratos Card comes in. At its very basic, it's one credit card that stores all you cards—credit, debit, gift cards, rewards cards, or whatever. Does the idea sound familiar? It should because companies like Coin and Plastc have been trying to do the same thing—all with varying success—but Stratos thinks it has a winning formula. Like the competition, Stratos stores up to three main cards on the physical card at one time, but with the Stratos app its able to suggest other cards in your inventory to use at certain locations, like a Starbucks gift card and Starbucks for instance. You swipe in cards using a card swipe attachment, also similar to Coin. Stratos is able to discern your location through the app via GPS, and the app also lets you easily switch out cards whenever you need them. You can also set a security timer, so if the card doesn't detect your phone for a certain amount of time, it locks down. One Stratos downside is that it doesn't use chip and PIN security tech, at least not yet. 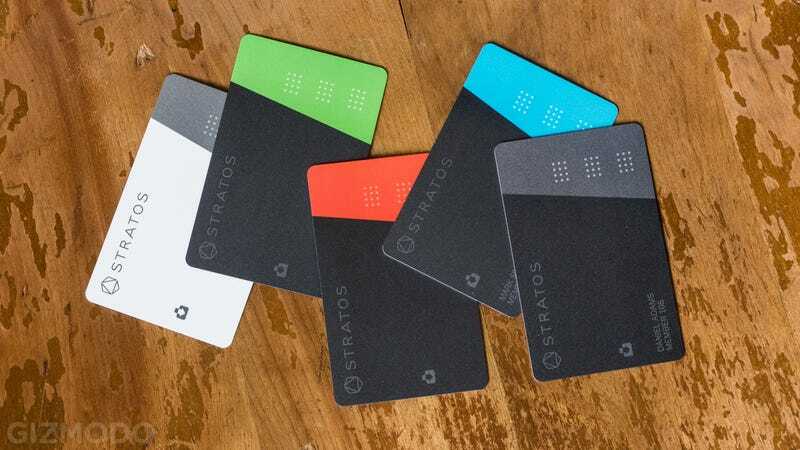 As part of the Stratos Card's $95 annual membership ($145 for two years), you'll get a new card every year, including upgraded ones when a new chip and PIN version does arrive (which the team says is on the way). The cards will begin shipping this April. 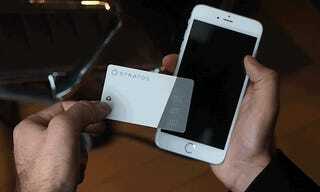 The Stratos Card is selling convenience, and our brief hands-on demonstrated that it can make your wallet lighter. But it's hard to say if this really is the one card to rule them all, or just the one among many.